It looks like the letter Q really had some of you stumped! Or perhaps like both me and my co-host Ros you were away on holiday in September and didn't have time to bake. It means there were fewer eligible entries for the great prize we had on offer as well, so scroll to the end to see who won the Hotel Chocolat giveaway! Jacqueline kicked off the entries this month with a Queen of Puddings: a traditional British dessert with a milk and breadcrumb base, spread with jam then topped with meringue which is then cooked in the oven. Elizabeth from Law Students Cookbook has taken the ingredients of s’mores – an American campfire snack consisting of graham crackers (digestive biscuits) and marshmallows, added banana – and turned it into bread! 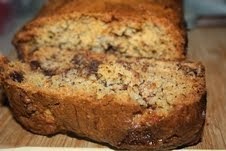 Her Banana S’More Quick Bread looks delicious and Elizabeth says it wasn’t too sweet. 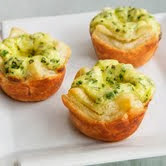 Eira from Cook Books Galore says she enjoyed the chance to make something savoury, and sent us these Herb, Shallot and Cheese Quichettes. 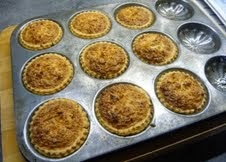 They are individual mini quiches baked in a puff pastry case and use herbs from Eira’s own garden. 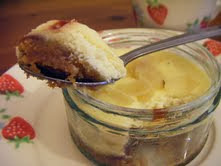 I also made a Queen of Puddings, but as I don’t like jam I decided to substitute curd – and found a jar of lime curd in the supermarket which I’d never eaten before. 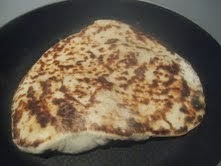 It was delicious and not hard to make at all. I also don’t like quiche normally as there is too much egg, so I was intrigued when I found a recipe in a weight loss magazine for a smoked salmon and dill quiche that combined egg and soft cheese in the filling. It gave the quiche a lovely flavor and meant it wasn’t too ‘eggy’. 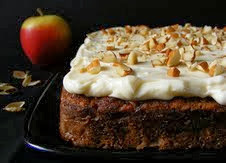 A lovely fruity entry here from Elizabeth of Elizabeth’s Kitchen Diary and an ingredient I hadn’t thought of – she made this Apple Cardamom Cake with Quince Frosting. Elizabeth says she hadn’t tried quince before so didn’t know what flavor to expect – see for yourself what she thinks. This is a great autumn bake. 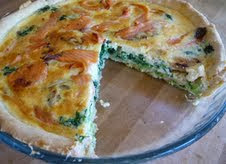 Here’s another smoked salmon quiche, but this time with fennel and spinach, from Jean of Baking in Franglais. 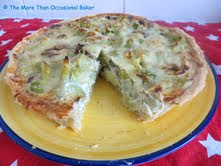 She says quiche is a great way to use up leftovers and she managed to avoid the infamous soggy bottom! , is something I love- Quark. It’s a sort of curd cheese, that I first ate when I lived in Germany – it is popular there as a simple dessert sweetened with sugar and lemon juice. Quark is a very versatile ingredient though and I use it a lot these days as it’s free on Slimming World, in both sweet and savoury dishes. These cheesecakes look delicious and thanks to Laura for hopefully introducing some of you to a new ingredient! My co-host Ros from The More Than Occasional Baker is off on holiday so only made one thing for this month’s challenge rather than her usual two or three! She has treated us to this Leek, Mushroom and Gruyere Quiche – the first time she has made quiche and she says pastry isn’t really her thing. I think this has turned out really well! 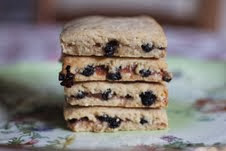 Clare thought of something that hadn’t occurred to me beginning with the letter Q, and made flapjacks using Quaker Oats – great idea! I love flapjacks but sometimes find they start to crumble when I slice them – these look like they held together really well. Johanna from Green Gourmet Giraffe made these Quince and Walnut Garibaldi Biscuits, which were inspired by the TV show “Call the Midwife”; these biscuits were considered post-war treats, but I think they still taste good today! A second entry from Jean at Baking in Franglais – and another outing for quince. She’s made these Quick Quince and Coconut Tartlets and funnily enough – given the previous entry- uses a 1940s cookbook for the recipe. 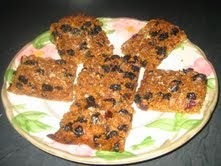 Jean even used her mum’s bun tin to bake them in, which she says must be about 60 years old! 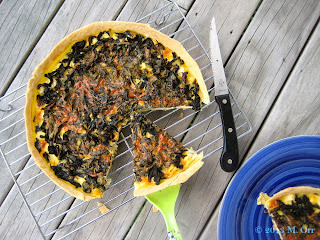 Silverbeet is an ingredient I didn’t think I was familiar with - Mel atSharky Oven Gloves, who lives in New Zealand, has used it to make this Silverbeet and Feta Quiche. But according to Google, those of us in the UK would know it by the name of Swiss chard. Whatever it’s called, her quiche looks very tasty. I was hoping someone would come up with a bake using quinoa and Sue from MainlyBaking did not let me down! 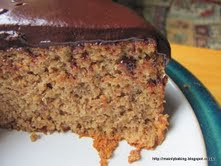 She sent in this Quinoa and Hazelnut Cake; she says there were several stages and the cake took quite a long time to make but it wasn’t difficult. She added a chocolate fudge frosting – can I have a slice please? A delicious savoury option from Fiona at Sweet Thing You Make My Heart Sing: she made these Quince and Camembert Flatbreads. 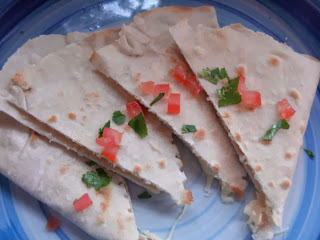 I love cheese and something sharp to accompany it – in fact I’m sure I’ve seen quince jelly on a cheeseboard before – so these flatbreads are a great way to combine the two flavours. Finally this month another Q idea from Vohn at Vohn’s Vittles – who I think might be a first time Alphabaker as well, so welcome! Here are some delicious Quesadillas – a toasted tortilla with melted cheese inside, though you can add pretty much whatever filling you like. Vohn has used chilli, spring onions, tomato, coriander and prawns, which sounds fantastic. Jean of Baking in Franglais. Jean, please give us your (UK) address and the prize will be on its way! I can't wait to find out which letter we are baking with in October.... there aren't many left in the alphabet to choose from! Ros at The More Than Occasional Baker will have the announcement on October 1st. Lovely round up of Q entries. I'm glad we got a bit of variety and some were really quite clever. You had a surprisingly large number of entries, considering !! And I'm so thrilled to have won the chocolates..........thank you!